The leaf in a pair of doors which the lock is applied to and which is the first to open. Half of a double door unit, the active door is the main operating door. Threshold that can be adjusted up and down to ensure a tight seal with the door panel. This creates a customized fit for changing weather conditions. The horizontal distance from the edge of a door to the center of a lockset. Clear glass, with edges that have been ground and polished to an angle other than 90 degrees. A tubular or cylindrical lock placed into a door via a bored opening. A decorative wood trim which is fastened to the exterior edge of a frame in order to conceal the seam between the door frame and the wall edge. Metal separator that holds individual pieces of decorative glass in place. Caming is typically brass or lead with a variety of decorative finishes. The trim around the interior of a window or door. A door stop is the small piece of wood, usually 1 3/8" - 1 1/2" wide, that is attached to the door jambs on both sides and on top of the door. This strip of wood is where the door comes to rest when it is closed. It stops the door from moving any further, and also covers the gap that would otherwise appear between the door and the jambs. Two vertical doors that meet in the middle of the door frame when closed. A door divided horizontally in half; the halves may be opened together or individually. The bolt used to lock in the bottom half to the top half of a Dutch door. A measure of the space between the floor and the bottom of the door. Sliding bolt mortised into the edge of a door or astragal that engages into the jamb head and sill to secure the door. An assembly of jambs, header, and sill, surrounding and supporting a door or doors, and perhaps also one or more transom lights and/or sidelights. A textured glass having slightly obscuring properties with an etched pattern resembling ferns or snowflakes. An organic glue is applied to the glass; as it dries it grows in a crystalline pattern, etching the glass in the process. 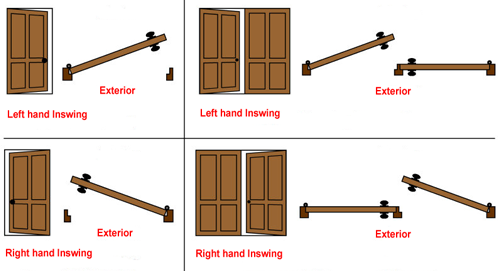 Is the method of determining how a door swings. Doors are either "right handed" or "left handed". A physical door that opens and closes, such as exterior and interior doors within a building, are normally attached to a jamb with hinges. There are many methods of determining handing. One method is to stand, or imagine yourself standing, in jamb of the doorway with your back against the hinges of the door. Swing your arm in the direction that the door will open. If you swing your right arm then the door is a right-hand door. Swing your left arm and the door is a left-hand door. A beam located over a door or window to carry or redirect any load from above the door to the side door studs. Designed for installation on doors of medium weight. May be used on wood or hollow metal doors and corresponding frames. For doors with average frequency of use or doors equipped with closers. Ball bearing hinges conform to ANSI A2112. Ball bearing hinges feature two permanently lubricated, non-detachable, hardened chrome alloy ball bearings. For doors with low frequency of use, plain bearing hinges which conform to ANSI A2133 may be used. The leaf of a pair of doors that does not contain a lock, but is bolted when closed, and to which the strike is fastened to receive the latch or bolt of the active door. When the door opens into the house when opened. The vertical member forming the side of a door, window or wall opening frame. A term used in reference to any product that is shipped disassembled, for assembly at the building site; commonly abbreviated "KD." Horizontal member of a door panel located where the locking mechanism would be installed. A joint between two pieces of wood, in which a projecting part of one piece fits into a corresponding cutout in the other. A lock fitting a rectangular shaped cavity in the edge of a door. A vertical trim piece which covers the mull post. The post set in the gap between the door and sidelight frames. Multiple locks located in various places on the door and frame. A term used for doors that swing to the outside or exterior of the home. A piece of wood or glass placed into openings in a wood door. A leaf placed inside the stiles and rails held in by molding. Hence the door style names: Flat Panel, Raised Panel and Glass Panel. An assembled unit with a door, doors or sidelights, which have been sized, hinged and assembled into a frame with the sill and moulding. This is a cut along the edge of a piece of wood, which usually receives a panel or similar door component. Horizontal sections which make up the construction of the door between the door stiles (top, cross or intermediate, lock, and bottom). The framed opening in a wall where a window or door is to be installed. Another term for the threshold or sill. A fixed, usually rectangular window placed on either side of a door. The horizontal piece of wood or metal forming the bottom frame of a window or door opening. The vertical members that make up a door's construction. The hinge stile receives the hinges; the lock stile receives the lockset. Metal plate which protects the wood jamb from wear by the lockset latch. Vertical piece of wood/metal attached to the inactive door of a double door unit. It houses the flush bolts and receives the lockset latch from the active door. Treated glass that is strengthened by reheating it to just below the melting point and then suddenly cooling it. When shattered, it breaks into small pieces. Approximately five times stronger than standard annealed glass; is required as safety glazing in patio doors, entrance doors, side lights, and other hazardous locations. It cannot be recut after tempering. A matching piece that usually slides into the outer edge of the threshold that extends the overall threshold depth. Rectangular, elliptical, or radius window installed over a door. Some transoms open to cross-ventilate a home, while others are fixed. A glazing method used in entry doors with decorative leaded, and/or beveled glass panels. The leaded glass panel is sandwiched between two pieces of clear tempered glass separated by metal spacers along the perimeter. The outer edge of this unit is then sealed with rubber, to create a fully sealed glass unit. Benefits: reduction in sound transfer, energy efficiency, easy cleaning. Individual lengths of rubber or plastic used to plug air leaks around doors and window frames.